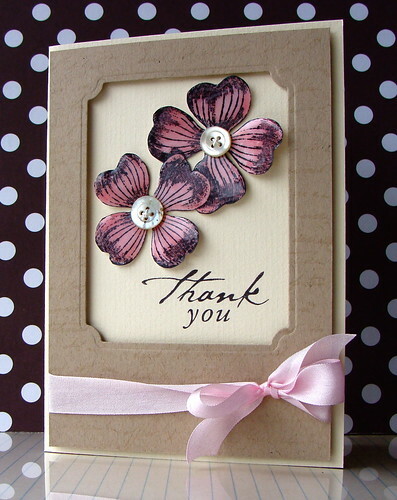 Cream, kraft and pink + antique buttons. Yum. Supplies: Stamps - Hero Arts, Buttons - Real vintage buttons from France! ; Cardstock - Bazzill; Ribbon - Creative Impressions; Nesties - Small Labels. Sooo gorgeous! Thanks for always sharing the supplies you use. Love the Hero set and what you're doing with your new Nesties! Love that frame and portrait like look, and the glossiness on the flowers! Very nice! Beautiful work, Lucy! The frame is perfect and the glossy flowers look so pretty. 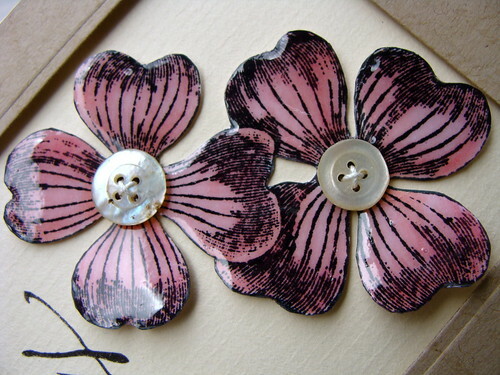 You are helping me see some really creative possibilities with this Dogwood stamp, thanks for the inspiring idea today. These are beautiful, Lucy (as always!) Love your challenge of creating 3 different cards/tone with one stamp! Love the glossy, love the buttons, love everything! Beautiful, vintage card! Lucy- another fantastic card. I NEED that stamp now I've seen what you have done - and as for that Nestie!!!!! Oh, so pretty! Love how you framed the flowers, too! Looking forward to seeing Day 3! BEAUTIFUL CARDS!!! ENABLER ALERT - guess where I am headed? To heroArts.com to order that stamp and more than likely some other stuff too!!! ROFL!!! Spectacular Lucy! Love your creations! Happy Easter! you sure do know how to sell a stamp! love all of these versions. I need this dogwood!